An area series is used to show quantitative data. It is based on a line series, in the way that the area between the boundary lines is emphasized with color. The LineSeries type defines the upper boundary of the area. The area chart is drawn using the bottom of the plot area as the lower boundary by default. Instead of the bottom of the plot area, the lower boundary can be specified by another line. In that case, the AreaSeries should use two LineSeries types. 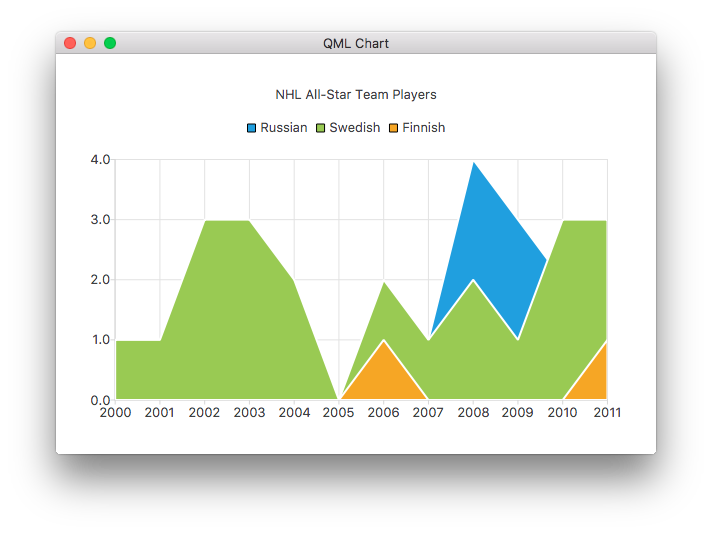 Note: Adding the same line series to a chart and area series is not supported. The series used as boundary lines should be defined only for the area series. See also axisX and PolarChartView. See also axisY and PolarChartView. Line (pen) color of the series. The name of the file used as a brush image for the series. Fill (brush) color of the series. The lower one of the two line series used to define area series boundaries. Note: If AreaSeries was constructed without a lowerSeries, this is null. Defines the color used for data point labels. By default, the color is the color of the brush defined for labels in the theme. See also QAreaSeries::pointLabelsFormat, pointLabelsVisible, pointLabelsFont, and pointLabelsColor. Defines the visibility of data point labels. The upper one of the two line series used to define area series boundaries.